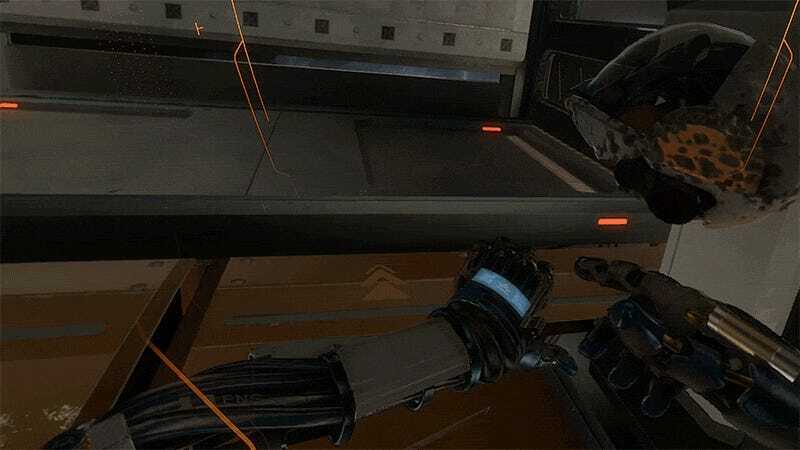 With an interesting deep space setting, a clever zero-gravity movement system and plenty of hands-on interaction, Ready At Dawn’s Oculus exclusive Lone Echo ticks all the technical boxes required to be an excellent virtual reality game. But its greatest feat is making me believe a woman could ever love an unfeeling robot like me. It’s a sad day aboard the Kronos II mining station orbiting Saturn. 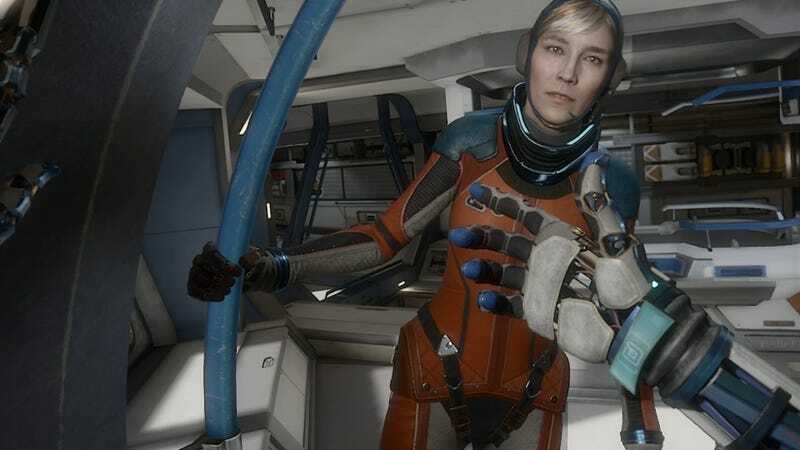 Captain Olivia “Liv” Rhodes, the station’s sole human occupant, is being transferred, leaving behind her faithful companion, a service android named Jack (AKA the player) to run things once she’s gone. Liv is obviously heartbroken over the news, and Jack doesn’t seem too thrilled either. Fortunately, a strange spatial disturbance suddenly appears, disrupting systems and kicking off one final ship maintenance-filled mission for the star-crossed couple. Jack and Liv aren’t lovers, but it’s pretty clear the self-aware android and United Solar Navy captain have formed a strong connecting during their time aboard the Kronos II. As the pair clamber about the ship they trade playful banter. When the player as Jack makes a mistake, the computer-controlled Liv gently chides him. And when the android finds himself in dangerous situations—it’s what he was built for—the captain shows genuine concern. It’s sweet. Jack caresses Olivia’s cheek before donning a thruster pack and heading out into the depths of space. My heart will go on. I wasn’t expecting this sort of touching interaction from Lone Echo. Hell, I wasn’t expecting to play Lone Echo at all. It was released last summer as an Oculus Rift exclusive at a time when all I had hooked up was my HTC Vive. And it’s from the Ready at Dawn, the studio that made The Order: 1886, so I wasn’t in any rush. If not for Kirk Hamilton’s gushing recommendation and the fact that I’d hooked up the Rift for VRChat, I might never have played Lone Echo. I downloaded the game yesterday, launched it around 10:30 PM, and when I finally took the headset off I was surprised to discover it was 12:30 AM. Two hours isn’t a long play session in terms of traditional games, but two hours in a VR headset is a marathon. I guess I fell a little in love with Jack and Olivia. It helps that Jack is voiced by Troy Baker (he’s so dreamy). British actress Alice Coulthard does a fine job in the captain’s seat, and Ready at Dawn’s facial animation really drives her performance home. Dialogue choices let the player steer the narrative somewhat. When Liv looks at Jack, it really feels like she’s seeing him. Or me. Or the player. She reacts to hand motions like finger guns, thumbs up and peace signs. If she jostles me as we move about the ship, she’ll say something. If I grab her arm to stop myself from floating through the zero gravity environment and hold on too long, she’ll jerk it away from me. This is a robbery. Stealing your heart. I am a robot. Without the interaction between Liv and Jack, Lone Echo would still be a great virtual reality game. The locomotion system is brilliant, having the player maneuver by grabbing the environment and pushing off in the direction they wish to travel. It’s the perfect movement method for a device that gives players virtual hands but no virtual feet. The engineering problems Jack must solve aren’t so much puzzles as they are tests of virtual reality manipulation and maneuvering. It’s always pretty clear what the player is supposed to do, but the tools they are given are incredibly cool. Hand-mounted propulsion jets, a laser cutter under one wrist and object scanner under the other—Jack’s got a whole toolbox in his hands. But Jack’s biggest asset in Lone Echo is Liv. She is his rock, if ever an android needed such a thing. Stepping out of the airlock after spending an hour and a half by her side repairing damage done to the station by the spatial disturbance, I felt genuinely anxious leaving her behind. As the situation grows more dire and the sinister secrets of the anomaly begin to unravel, I’m worried about the pair losing each other. It’s that sort of emotional resonance that makes sitting in my office chair for two hours with my vision and hearing compromised totally worth it.